Received a Bachelor of Science degree from the U.S. Military Academy, West Point, in 1950 and a Master of Science degree from the California Institute of Technology in 1957. He completed the Harvard Business School’s Advanced Management Program in 1970. 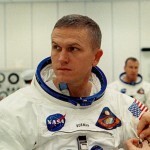 Borman was a career Air Force officer from 1950 to 1970, when he retired with the rank of colonel. He served as a fighter pilot in the Philippines, as an operational pilot and instructor with various squadrons in the United States, as an assistant professor of thermodynamics and fluid dynamics at West Point and as an experimental test pilot at the USAF Aerospace Pilot School. 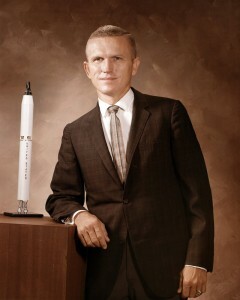 Selected as an astronaut in 1962. In December 1965 Borman and Jim Lovell spent a record 14 days in Earth orbit aboard Gemini 7. During the flight, Gemini 6 was launched and the two crews performed the first space rendezvous. Assigned the command of Apollo 8. 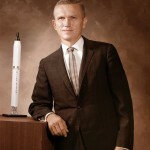 Along with Jim Lovell and William Anders, Borman orbited the Moon ten times. The mission was originally intended to be an Earth orbit test of the CSM but was reassigned in order to beat Russia to the Moon. It was only the second manned flight of an Apollo capsule and there was no lunar module to act as an emergency life boat.